THE REVIEW: Much like the promise of Tomorrowland, the film Tomorrowland has a lot of potential and a great eye-catching draw. It’s futuristic, massive, beautiful, and peaceful. The film, like the location, is magnificent and grandiose in a way that mesmerizes you and makes you believe that anything is possible, as long as you can imagine it. But while this may all seem hunky-dory and a-ok, Tomorrowland continues to be shrouded in an unexplained mystery even after the credits begin to roll. Brad Bird, the director, was very vocal during the marketing campaign for this film about not showing a lot of the story in trailers and TV spots. His goal was to save the mystery and suspense for when you are in the theater rather than spoil everything in 30 seconds before the lights even dim. I applaud Bird for taking that approach and fighting for less spoliery trailers, but when the film itself doesn’t shed much light on what the actual point of the film is supposed to be, that’s when I lose interest and view the entire venture as not fully developed. This isn’t to say that Tomorrowland doesn’t have a point or a clear message that it’s trying to get through. On the contrary, I think there are a few clear points Bird and writer Damon Lindelof (of Lost fame, or infamy depending on who you ask) easily get across. One clear message is the impending destruction of planet Earth through climate change/global warming, nuclear weapons, and constant war between nations. The flip side of that coin is dreaming of a peaceful future-world (named Tomorrowland), imagination and innovation, and having hope and optimism about things to come. Both messages are prevalent in the film to differing degrees. The optimistic one is well done. It isn’t too over-the-top and it is an encouraging path to follow in the film and in real life. The world can use more optimism and hope for the future, because without it, as Tomorrowland suggests, we will probably be met with an uncontrollable and disastrous fate. The doomsday scenario however is way too overblown and in-your-face. For comparisons sake, look at a film like WALL·E that also has a strong apocalyptic/save-the-planet message. The difference is in WALL·E, we observe that information and underlying message through visuals and background clues. We see what our actions have done to the planet and the possible future we will have if we continue on our current path. Tomorrowland opts for the tell-don’t-show method and puts all the information in exposition. We don’t just see the destruction that will be our future, we hear about it, and boy do we hear a lot. WALL·E succeeds with it’s environmental/political message because it allows the viewers to draw conclusions for themselves. Tomorrowland however shoves the conclusions down the viewers throats and makes it impossible to notice much else about the film besides the fact that we’re on a path to certain destruction unless we all become optimists and let our imaginations run free. This is all coming from an optimist. I always tend to view things in the most favorable light and have hope that everything will work out in the end. Like Casey Newton (Britt Robertson), I don’t always accept that the probable outcome will always be the actual outcome. If you want to change things and create a different outcome, you can. 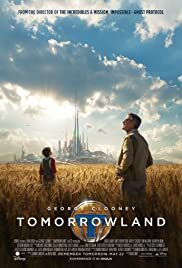 In this regard, Tomorrowland seems like it would be the perfect film for someone like me: a utopian dream of the future combined with science-fiction elements, beautiful set designs, and action sequences that only a director like Brad Bird can pull off. But all of this goodness is hidden behind a layer of secrecy and confusion that doesn’t become any clearer after having seen the movie. What exactly is Plus Ultra? (This video explanation, which was cut from the final film, doesn’t really help and just reiterates the doomsday/optimism duality.) Was Tomorrowland constructed by human innovators or was it simply discovered in the trans-dimensional whatever the fancy term they used was? Are the Audio-Animatronics like Athena (Raffey Cassidy) creations of human inventors? How did Governor Nix (Hugh Laurie) get elected and do they really have an elixir of life in Tomorrowland that keeps him from aging? The list of questions goes on, which in and of itself isn’t necessarily a bad thing. What is damning about the film is that some key origin/background related questions that are central to the entire story are left unanswered and leave the viewers puzzled as to how everything fits together. THE TAKEAWAY: Tomorrowland as an idea and a place to strive for is solid. Tomorrowland the film is an incomplete fantasy that suffers from a lack of explanation about the story and origins, while also suffering from an over-explanation on the philosophy that Bird and Lindelof try to ram down the viewers throats. Visually, the film is striking and fun to watch, but at the same time it’s merely a nice layer of paint on a drawn-out and poorly paced story that leaves you scratching your head. While director Brad Bird would disagree, you can skip viewing Tomorrowland in theaters and wait until the home video release.